Twelfth century fashion in Europe differed from the previous centuries only for a few details. 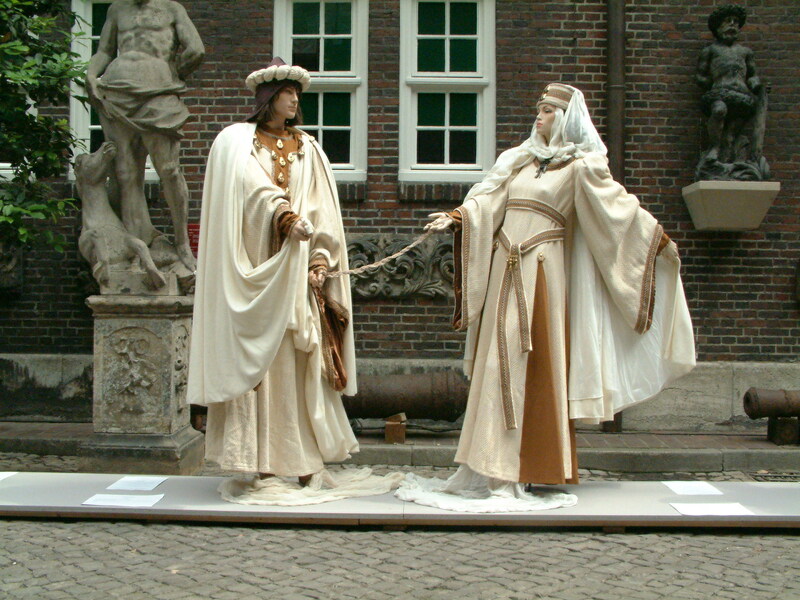 Both men's and women's clothing were still characterized by the use of tunics, shorter or longer, depending on the social status of the wearer. More elaborated clothes, with sleeves were instead characteristic of the wealthier classes. As in previous years, two styles of clothing coexisted simultaneously in men's fashion: the first consisted of a short tunic (to the knees), derived from the stylistic contamination of everyday clothes used in the Roman Empire with the uniforms of the barbarians. The second consisted of a long tunic (to the ankle), adopted from the fashion of the Byzantine bourgeoisie. It was only at the end of 1200 that the style became richer. Long sleeves, surcoats, tiaras, scapulars. People also started to use buttons called "pomelli" (knobs) or "maspilli". Dressed aso became longer and with large trains.